Place the fresh cranberries, sugar and coriander in a pot with just enough water to cover the bottom. Simmer on a low heat until the berries are soft. Place the mixture in food processor and blend until you get a smooth consistency. Run through a strainer. Add a pinch of sea salt to the cream, which will really bring out the flavour of the truffle mixture. Add the cream to the cranberry mixture and bring the mix to a boil. Next pour the mixture over 460g of the milk chocolate and leave it to sit for 5 minutes, allowing the mixture to melt the chocolate. Stir until fully combined and run through a strainer into clean bowl. Stir in butter then cover with plastic wrap. Refrigerate overnight. Melt 30g of milk chocolate in a bowl over pot of hot water. Remove the ganache from refrigerator and using your hands quickly roll into small balls and place on parchment paper. Hand roll ganache balls in the tempered milk chocolate and place onto clean parchment paper. Store in airtight container in a cool dark place. The truffles will be perfect for for10 days. 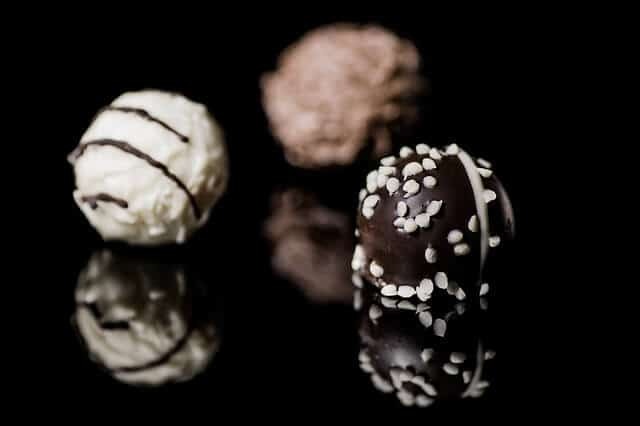 Wash your hands with cold water before rolling the truffles to prevent them from melting. Give you truffles an even more delicious flavour by coating them in cocoa power. Once you have dipped the truffles in the chocolate place them on a plate of cocoa power. When the chocolates have almost set, roll in the cocoa power and leave on the parchment paper to finish setting.